Although the Toyota Prius might be winning the hybrid branding battle, the Honda Insight hybrid is still the high-water mark for green cars. 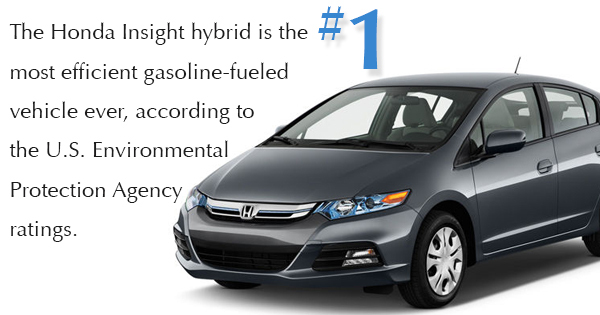 In fact, the Honda Insight hybrid is the number one most efficient gasoline-fueled vehicle ever, according to the U.S. Environmental Protection Agency ratings. This hybrid boasts an impressive fuel economy, with a stellar 61 miles per gallon on the highway and a combined 53 mpg city/highway rating. Of all the problems reported by Insight drivers, none were more commonly reported than the warning light indicating a problem with the Honda Insight battery. Although this problem is hardly unique to Honda hybrids, it’s still a day that every driver dreads. Fortunately, most drivers have a warranty to help cover the cost of your Honda Insight battery replacement. If not, you can pick up hybrid battery replacement online (and that will come with a warranty). While hybrids of all make and model are famously quiet, the Honda Insight wasn’t always so quiet from the driver’s point of view. In order to get that legendary EPA rating, Honda trimmed weight from their vehicle in every way they could. And, yes, that meant losing traditional sound insulation materials. So while your hybrid might sound quiet to pedestrians and other drivers, at high speeds the Insight was often unbearably noisy. Still, that may have seemed a small price to pay, as gas prices were pushing $4 a gallon when the Insight era was at its peak. The Honda Insight hybrid’s “Auto Stop” feature would soon become standard on most hybrids. This function allows the computer to shut off the engine when the vehicle was at rest, saving gas and increasing fuel economy. Unfortunately, some drivers reported that the engine didn’t always kick back in when you needed it to. In most cases, the source of the problem was an old battery reaching the end of its life. So if you’ve been experiencing this problem, consider a battery replacement. When the Insight first came out all those years ago, most drivers probably expected its incredible fuel economy to be unimpressive by 2015. Instead, we’re still talking about it today.